We did a relatively short hike in the Waitangi area, and were thrilled with the Pied Shag Hotel and Nursery. You’ll see. This hike actually started with a waterfall at the beginning rather than being the reward at the end. It wasn’t a loop route, so we had a choice. It had rained recently (I mean, it rained almost every day. Have you noticed the skies in my photos?) 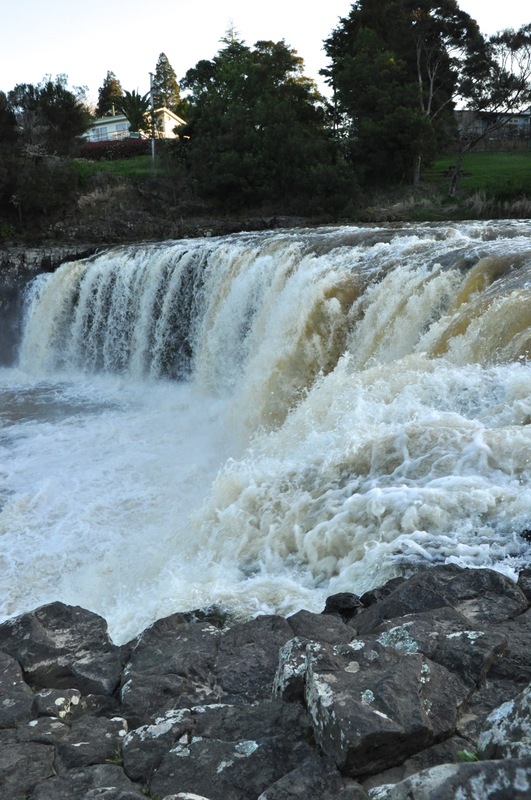 and there was a bunch of brown silt in the water which you can see in the waterfall. Unique for me, I could walk right up to the corner of that falls there in the foreground and put my hand in the water, my toes at the edge, the water going by at quite a clip as it executed its lemming thing. Ginger opted out of the thrill. Hikes here are interesting because the flora is like nothing we have seen. The trees are amazing, and the tree ferns incredible. Below are two shots of the trail. Then, as we walked along a bank over the river, we encountered quite a few trees filled with birds called Pied Shag (they act like cormorants). Many in nests. With the cutest cuddly fuzzy babies. Quite a nursery, with feeding going on, teenage Shag begging for more handouts, mommas diving, daddies building nests, birds fighting, real family time. Because we’re on a bank and they’re in a tree, we’re eye-to-eye. Amazing. Here are some pictures. The hike also included a trip through a mangrove swamp. 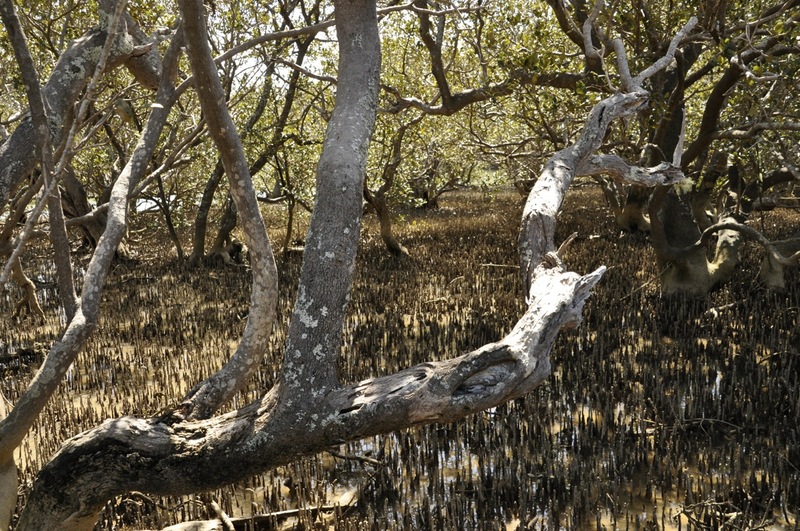 Big mangrove swamp (they’re everywhere, really, but kinda hard to walk through without a boardwalk). There was a loud snapping sound occurring randomly in the swamp – turns out they’re “snapping” shrimp in burrows. I hope you’ll forgive me if I don’t show you a photo of shrimp burrows (holes) in the mud. Next post will be about a boat trip around the Bay of Islands. How can you not take a boat trip if you’re visiting a place called “Bay of Islands”? So Kool. Otherworldly. Thanks for sharing all this amazing stuff with us mere mortals stuck on the blasé plain.